But it takes more than a wintry storm to keep the people of Wootton Fitzpaine away from an Artsreach event in their hall, and the beautiful Arts and Crafts building was packed for Adverse Camber’s performance, which was postponed earlier this year after particularly awful weather! A recent speaker on the radio talked about the art of great storytelling, the way a gifted storyteller can transport the listener to another time and place, wrap you in another world where you are lost in the magical forest, burned by the dragon’s breath or swept into the prince’s strong arms. 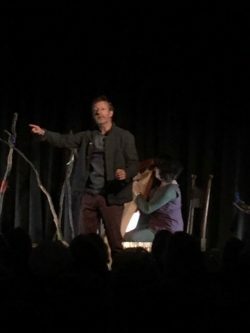 And so it is with Adverse Camber’s Michael Harvey, the teller of the tall tales that inspire Dreaming the Night Field, legends of ancient Wales culled from The Mabinogion, a collection of tales originally gathered in the 12th or 13th centuries, but based on much older legends. These are stories of kings with unimaginable magic powers, of shape-shifting wizards who can turn seaweed into sea-worthy boats, punish men by turning them into stags or wild boars, sing a wounded eagle down from a high tree and draw a witch-princess’s illegitimate baby out of her body into a magic circle. Michael Harvey, speaking at times in Welsh, as do singer Lynne Denman and composer/musician Stacey Blythe, is a sort of wizard, conjuring this world of ancient forests and stones, drawing us in so that we seem to see Gwydion’s magic create hunting hounds and proud chargers from forest mushrooms to steal the pigs from the King of Dyfed. Dreaming the Night Field, with its evocative elemental soundscape of music and songs by Stacey Blythe, was commissioned by Adverse Camber in association with Felin Uchaf, Cardiff University School of Welsh and Aberystwyth Arts Centre – and it is remarkable to discover that none of the performers are native Welsh speakers! Posted in Reviews on 12 November, 2018 .